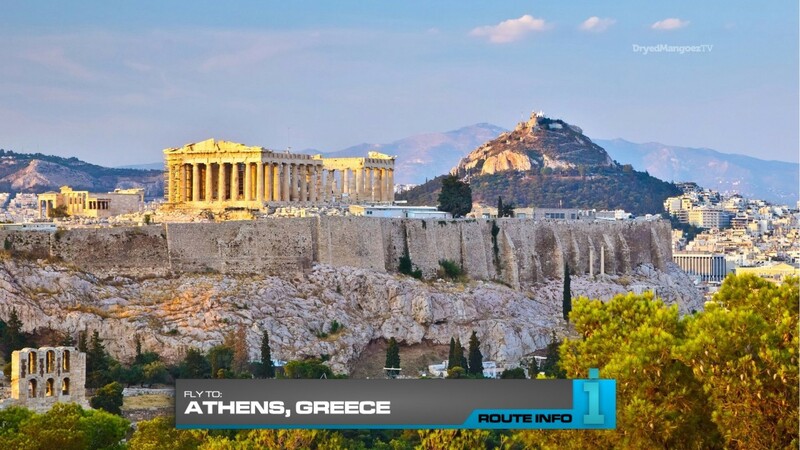 Teams have crossed the midpoint of the Race and they must now fly to Athens, Greece! Teams will book their own tickets and will magically end up on one of three flights: Lufthansa via Frankfurt arriving at 1:25pm, Austrian via Vienna arriving at 1:35pm and Air France via Paris arriving at 2pm. 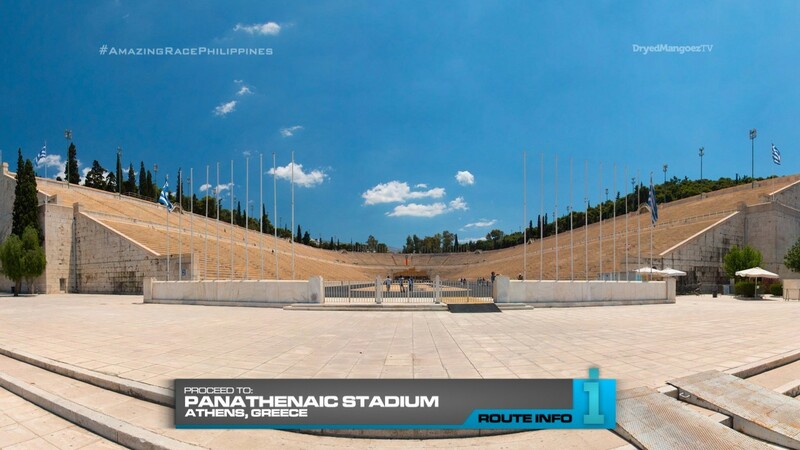 Once in Athens, teams must make their way to Panathenaic Stadium. They will search the stadium for their next clue. 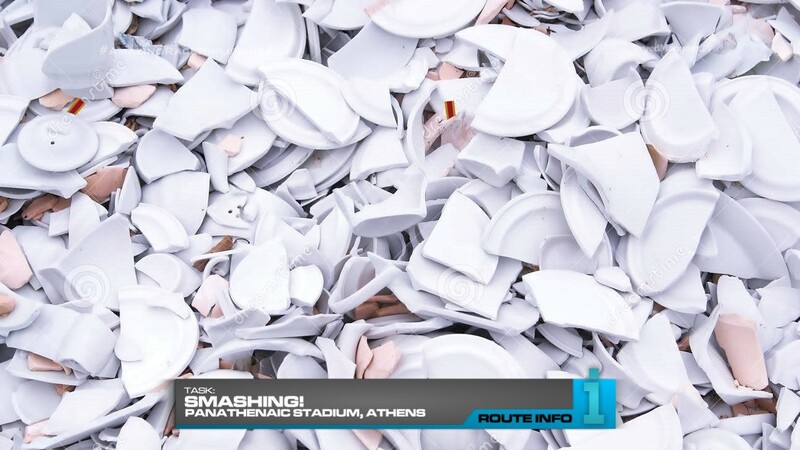 That clue tells teams will take part in the Greek tradition of breaking plates for good luck. For this task, teams must smash plates until they have found one with a small Race flag baked into it. Once they have found the small flag, they will be given a fresh, unbroken plate which they must safely keep until further notice. 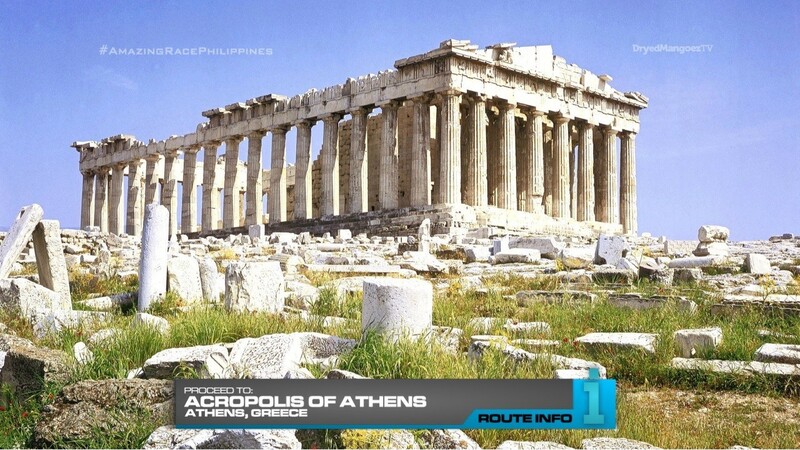 They will be given their next clue which directs teams to search for their clue at the Acropolis. And here, teams will find a Double Yield! Teams will need to check-in. Teams with a Super Yield may use it here as well. 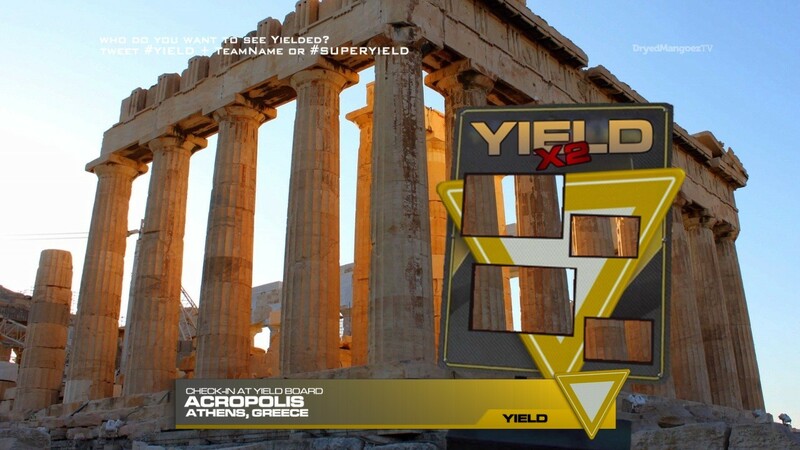 After checking in at the Yield board, teams can open the next clue revealing the Detour: Work or Play. In Work, teams must build columns using all the marked pieces provided. What teams don’t know is that there are some smaller pieces lying around that will fill in certain holes in what teams believe are just deteriorated looking columns. In Play, teams must participate in three ancient Olympic events: discus throw, javelin throw and wrestling. If teams have made competitive throws and can stay in the wrestling circle for a minute each, teams will receive their next clue. 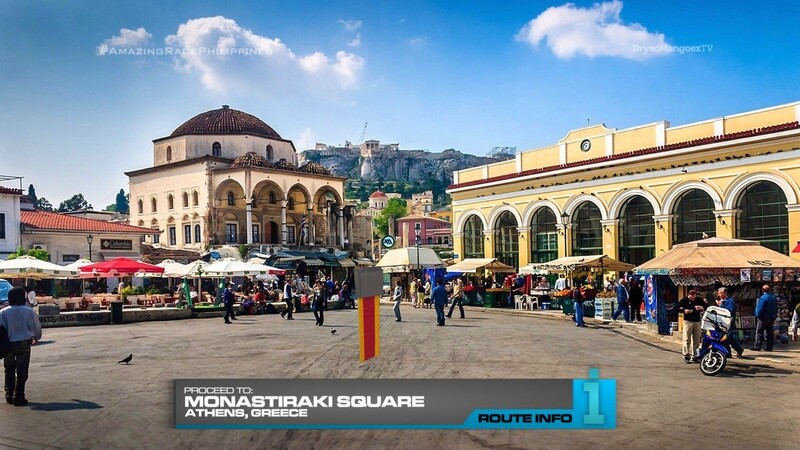 After the Detour, teams must make their way to Monastiraki Square. And here, teams will find the Road Block: Who’s willing to skewer the competition? 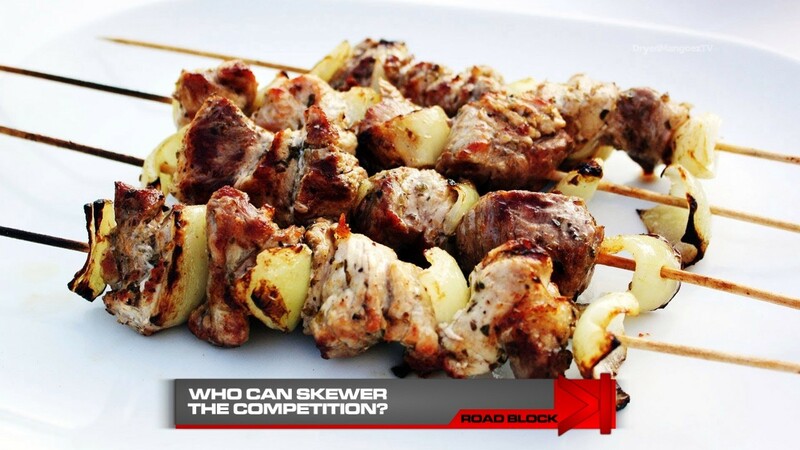 For this Road Block, teams will prepare souvlaki, a popular Greek fast food consisting of small pieces of meat and vegetables grilled on a skewer. Once they’ve prepared and grilled 12 skewers, they will place them on the plate they received from Panathenaic Stadium. They will then deliver the plate, on foot, to a nearby address. Teams can only use one hand to hold the plate. They will be allowed to switch hands, but they cannot have two hands on the plate for more than three seconds. Once they’ve delivered the souvlaki, they will receive the next clue. 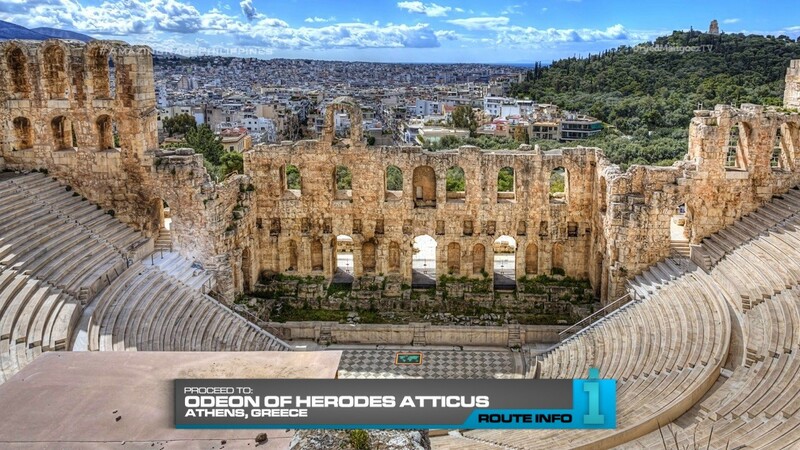 And that clue points teams to the Pit Stop, Odeon of Herodes Atticus. Welcome to Greece! Athens was actually a planned TARPHDME in a previous season, but was changed at the last minute because of the country’s financial crisis and chaos that resulted. But now that things have settled a little bit, it’s a nice time to help support tourism to the country with a nice Leg (or two) from The Amazing Race. This Leg is very touristy, no doubt. The plate breaking is a fun little task to fill out a Leg. A more realistic location would probably be at some big house or party gathering place or restaurant. 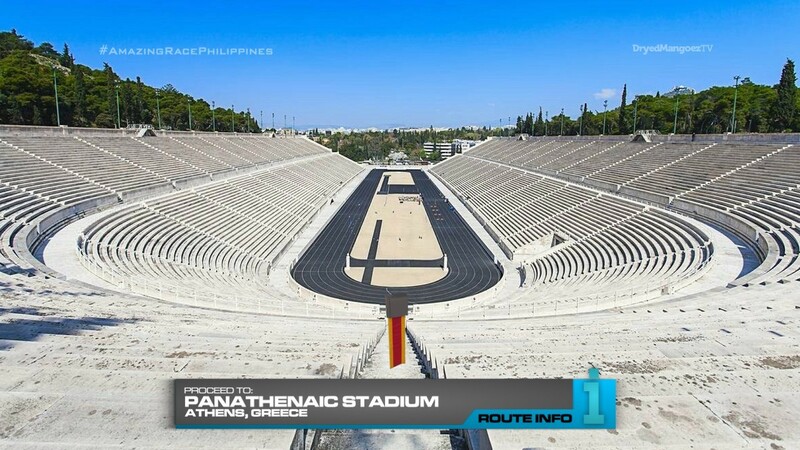 But I’ve put Panathenaic Stadium here just because it would look great in HD. Especially from aerial drones! Woohoo! This would also be a perfect Pit Stop as well. The Detour is a mix of and inspired by previous TAR tasks. 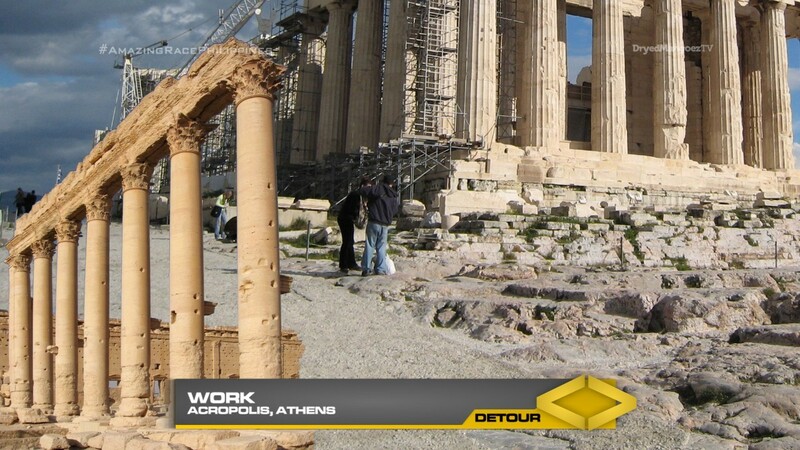 The Olympic side of the Detour is TAR9’s task. And the building side of the Detour is kind of like the TAR18 dinosaur fossil Road Block of TAR18. I don’t even know if there’s a suitable location near the Acropolis for either task. But again, it would look great on TV. The Road Block is straightforward and maybe a little simple. The one-handed part of the task is also typical TAR used in various situations so that should challenge the teams a bit. Also great to have teams wandering around foreign cities on foot. And to complete this Athens Leg, another historic and atmospheric location would be great for the Mat. Overall, a nice little Leg in Athens.